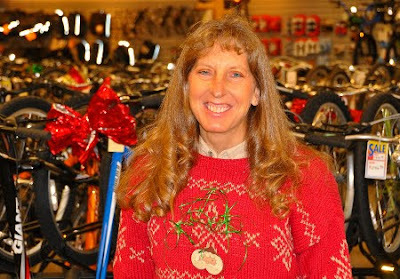 Century Cycles Blog: Crazy Christmas Sweater Sightings! We've had our first sightings of Crazy Christmas Sweaters in Century Cycles stores today! In Medina, long-time customer Linda Miranda (above) chose a free "Define your life. Ride a bike. TM" pint glass and a bottle of Great Lakes Christmas Ale. 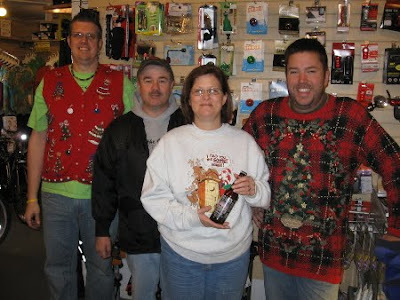 In Peninsula, Nancy Dinger and her husband Ron (shown above with staff members Rich [left] and Doug [right]), also selected the free pint glass and Great Lakes Christmas Ale. Thanks Linda, Nancy, and Ron for being loyal customers and embracing the spirit of the season!